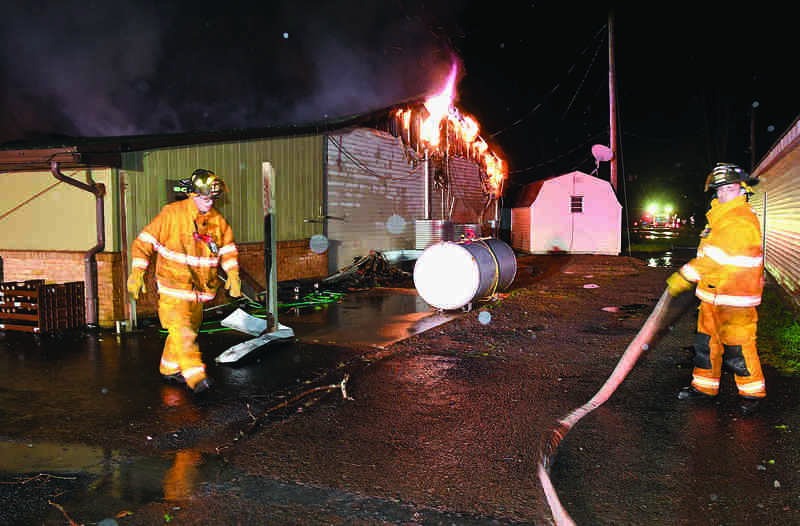 The storm, which blew into the area around 1 a.m., also likely caused a fire that gutted the newly renovated Mill Race Golf Course clubhouse, and destroyed the course greens and campground. See a photo gallery of damage. Standing next to the charred remains of the clubhouse, Redner pointed out a wide swath of felled trees on the nearby mountainside. The same high winds that took down those trees blew through the campgrounds, where he and nine others had been staying last night, he said. “There are 40 campers with trees right through the middle of them,” he said. Luckily, no one was hurt, but all the campers are stuck, Redner explained. It’s nearly a mile back to the campground and both roads that lead to it are blocked by massive trees. Even if the roads were clear, many of the campers’ cars were smashed by downed trees, he noted. Mill Race maintenance worker, Jack Schupp, who lives nearby, fetched Redner with a backhoe shortly after 2 a.m. after learning the clubhouse was on fire. The blaze appeared to have started near the weatherhead, which is where all the electrical service comes into the building, according to State Police Fire Marshal Jamie Sgarlat. Although the cause of the fire is undetermined, it’s most likely a result of the storm. “It’s either a lighting strike or the result of downed wires,” he said. Those living in the Berlin’s Mobile Home Park were some of the hardest hit in the area, with one trailer tossed on its roof and another half dozen lifted from their foundations. Pam Moss, 62, said she was at her son Willard’s trailer last night when the storm hit. “All of a sudden, it lifted up and dropped back down,” she said. Willard, 37, grabbed his pit bull and the three ran to the hallway to wait out the storm. 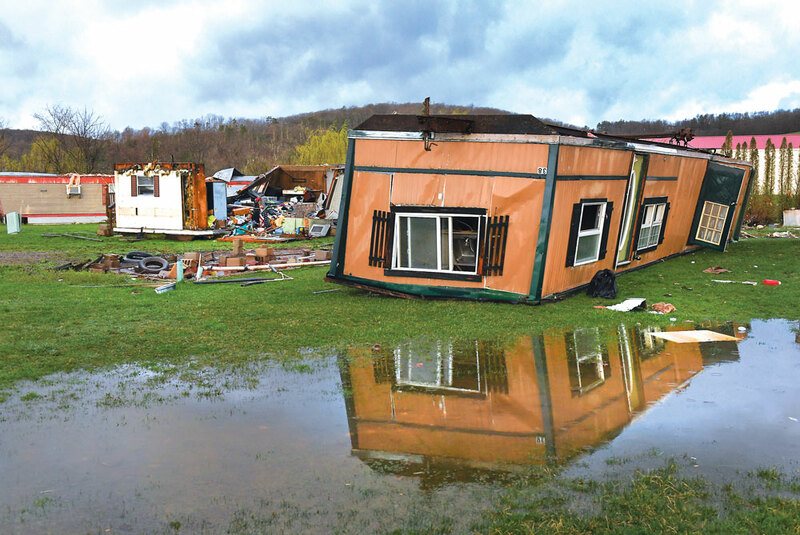 It wasn’t until the next morning Moss discovered the roof on her home, which was just a few trailers away, had blown off. She had it replaced two years ago when a tornado tore through the park, she said. But at least she and her son were safe, she said. Another neighbor was taken to the hospital after winds tore a hole through his trailer, she said. Homeowners, borough workers, and tree service employees were busy clearing large sections of Benton borough, while crews from PennDOT and PPL worked to clear downed trees and power lines along a closed section of State Route 487 Monday morning. We'll have more on Benton and other spots left damaged by early Monday's storm in Tuesday's Press Enterprise.